Library and Archives Canada (LAC) (in French: Bibliothèque et Archives Canada) is a federal institution tasked with acquiring, preserving and making Canada's documentary heritage accessible. It is the fourth biggest library in the world. LAC reports to Parliament through Pablo Rodríguez, the Minister of Canadian Heritage since August 28, 2018. The Dominion Archives was founded in 1872 as a division within the Department of Agriculture and was transformed into the autonomous Public Archives of Canada in 1912 and renamed the National Archives of Canada in 1987. The National Library of Canada was founded in 1953. Freda Farrell Waldon contributed to the writing of the brief which led to the founding of the National Library of Canada. In 2004, Library and Archives Canada (LAC) combined the functions of the National Archives of Canada and the National Library of Canada. It was established by the Library and Archives of Canada Act (Bill C-8), proclaimed on April 22, 2004. A subsequent Order in Council dated May 21, 2004 united the collections, services and personnel of the National Archives of Canada and the National Library of Canada. Since inception LAC has reported to Parliament through the Minister of Canadian Heritage. The Preservation Centre in the city centre of Gatineau, about 10 kilometres away from the Ottawa headquarters, was designed to provide a safe environment for the long-term storage and preservation of Canada's valuable collections. 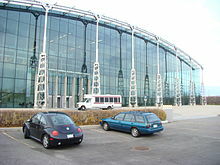 It was built at a cost of CDN$107 million, and the official opening took place on June 4, 1997. It is a unique building containing 48 climate-controlled preservation vaults and state-of-the-art preservation laboratories. In 2000, the Royal Architectural Institute of Canada named it one of the top 500 buildings constructed in Canada during the last millennium. A planned key activity for 2013–14 was to rehouse analogue (non-digital) information resources in a new state-of-the-art high-density storage facility in Gatineau, where the national newspaper collection and records of Second World War veterans will be stored. The facility will feature a high bay metal shelving system with a suitable environment to better protect Canada's published heritage. In January 2019, Library and Archives Canada announced that negotiations for a new facility to be built next to the existing one in Gatineau were starting, with an opening date in 2022. Following the announcement in the 2012 federal budget of a CDN$9.6 million funding cut over the three years commencing in 2012–13, more than 400 LAC employees received notices which indicated their jobs may be affected and the department announced a 20% reduction of its workforce of about 1,100 over the following three years. The "harsh" wording of a 23-page code of conduct for employees effective January 2013, which "spells out values, potential conflicts of interest and expected behaviours", has been criticized by the Association of Canadian Archivists and the Canadian Association of University Teachers among others. The code describes personal activities including teaching and speaking at or attending conferences as "high risk" activities "with regard to conflict of interest, conflict of duties and duty of loyalty" and participation in such activities is subject to strict conditions. In a section on duty of loyalty, it also cautions employees about expressing personal opinions in social media forums. Only authorized LAC spokespersons may issue statements or make public comments about LAC's mandate and activities, which includes controversial changes related to modernization and budget cuts. Academic Ian Milligan describes LAC's "rhetoric of modernization" as a "smokescreen" for cutting services in light of the insignificance of and limited accessibility to LAC's online collections on the ActiveHistory.ca website. In June 2013 the Heritage Minister said speeding up the digitization of records will be a priority for the new Librarian and Archivist of Canada. Moore also said he will ask the person appointed to revisit the termination of the National Archival Development Program. During the Truth and Reconciliation Commission of Canada, Library and Archives Canada initially failed to produce records requested by the commission in a timely and comprehensive manner and was ordered by an Ontario Superior Court judge to do so. Ultimately, LAC did provide the records, but many were not in digitized and searchable formats as required by the commission. "69. We call upon Library and Archives Canada to: fully adopt and implement the United Nations Declaration on the Rights of Indigenous Peoples and the United Nations Joinet-Orentlicher principles, as related to Aboriginal peoples' inalienable right to know the truth about what happened and why, with regard to human rights violations committed against them in the residential schools; ensure that its record holding related to residential schools are accessible to the public; [and] commit more resources to its public education materials and programming on residential schools." Library and Archives Canada has begun to address these concerns by dedicating funding to hire Indigenous archivists, build relationships with Indigenous communities, and support digitization efforts. However, Indigenous-led organizations have drawn attention to the fact that Indigenous communities have been conducting this type of work for decades. LAC also holds and provides access to archival copies of the websites of organizations related to the TRC, in collaboration with the National Centre for Truth and Reconciliation, the University of Winnipeg Library, and University of Manitoba Libraries. On April 14, 2014 Guy Berthiaume was appointed Librarian and Archivist of Canada by Minister of Canadian Heritage Shelly Glover for a five-year term commencing June 23, 2014. ^ a b c "Justice Laws Website: An Act to establish the Library and Archives of Canada, to amend the Copyright Act and to amend certain Acts in consequence". Government of Canada. Archived from the original on March 29, 2012. Retrieved May 26, 2013. ^ "House Government Bill – C-8, Royal Assent (37-3)". Parliament of Canada. Retrieved May 26, 2013. ^ "Discover the Collection: Canada's Continuing Memory – Browse by Product Type". LAC. Archived from the original on June 3, 2013. Retrieved June 2, 2013. ^ "Legal Deposit". LAC. Archived from the original on May 30, 2013. Retrieved May 28, 2013. ^ "Digital Collection Development Policy". LAC. February 1, 2006. Retrieved June 2, 2013. Refer section on Selection and Acquisition Criteria applicable to both digital and other media. ^ "2013–14 Estimates" (PDF). Treasury Board Secretariat. p. II–201. Retrieved May 26, 2013. ^ a b c "Report on Plans and Priorities 2013–14". LAC. Retrieved May 31, 2013. ^ a b c "Organization Profile – Library and Archives of Canada". Governor in Council Appointments. Government of Canada. June 5, 2014. Retrieved July 1, 2014. ^ "History of LH&A: Freda Farrell Waldon | HPL". Hpl.ca. Retrieved August 11, 2016. ^ Wilson, Ian E. (1982). "'A Noble Dream': The Origins of the Public Archives of Canada". Archivaria. ACA (15): 16–35. Retrieved June 3, 2013. ^ "Speech – Posthumous Tribute to Jean-Pierre Wallot". Government of Canada. Retrieved May 30, 2013. Following his appointment in the spring of 1985, he was given the task of reviewing the Public Archives Act of 1912, which led to the federal institution’s first name change. The institution that had been known as the Public Archives of Canada since 1872 was renamed the National Archives of Canada. ^ "Library and Archives Canada". Canada–France Archives. Archived from the original on March 3, 2016. Retrieved May 30, 2013. In 1872, the Canadian government created an Archives Division within the Department of Agriculture; its mandate was to acquire and transcribe documents related to Canadian history. In 1912, parliamentary legislation transformed this division into an autonomous organization, the Public Archives of Canada, and confirmed its responsibility to manage government documents. The mandate of the new institution focused on the acquisition of documents on all types of media, putting into practice the innovative concept of 'total archives.' Further legislation in 1987 clarified and reinforced the role and responsibilities of the Public Archives of Canada, which was then renamed the National Archives of Canada. In October 2002, in order to improve access to Canada’s documentary heritage, the government announced the creation of a new institution, Library and Archives Canada, which united the National Archives of Canada and the National Library of Canada (founded in 1953). ^ "House Government Bill C-8 (37-3)". Parliament of Canada. Retrieved May 26, 2013. Last Stage Completed: Royal Assent (2004-04-22). Coming Into Force: Her Excellency the Governor General in Council hereby fixes May 21, 2004 as the day on which that Act comes into force, other than sections 21, 53 and 54, which came into force on assent. ^ "Financial Administration Act – Schedule I.1". Government of Canada. Retrieved May 31, 2013. ^ "Our Mandate". LAC. Retrieved May 31, 2013. ^ "Directive on Recordkeeping". Government of Canada. Retrieved May 31, 2013. ^ "Overview – About the Collection". LAC. Retrieved May 29, 2013. ^ a b "Electronic Collection". LAC. Retrieved June 2, 2013. ^ a b c "Visit Us". LAC. Retrieved June 3, 2013. Much of Library and Archives Canada's collection has not been digitized and is only available in physical form. To use this material, you will have to visit one of our locations. ^ "Library and archives interlibrary loans soon eliminated". CBC News. November 7, 2012. Retrieved June 2, 2013. ^ a b Hall, Joseph (March 10, 2013). "Historical letters not wanted at Library and Archives Canada, critics say". Toronto Star. Retrieved May 26, 2013. ^ a b Cobb, Chris (May 3, 2013). "Record breaking". Ottawa Citizen. Archived from the original on May 30, 2013. Retrieved June 2, 2013. ^ a b c "Library and Archives Canada – By the numbers". Ottawa Citizen. May 3, 2013. Archived from the original on May 27, 2013. Retrieved June 4, 2013. ^ "Proclamation of the Constitution Act, 1982". LAC. Archived from the original on June 28, 2013. Retrieved June 3, 2013. This original copy of the Proclamation of the Constitution Act, 1982 is the one which was signed by HM Queen Elizabeth II on Parliament Hill, 17 April 1982. Damaged slightly by rain during the signing ceremony, this version is informally known as the 'raindrop' copy. ^ "Sir John A. Macdonald: Canada's Patriot Statesman". LAC. Retrieved June 3, 2013. ^ "Constitutional Achievements". LAC. Retrieved June 3, 2013. ^ "Jacob M. Lowy Collection". LAC. Archived from the original on June 4, 2013. Retrieved June 3, 2013. ^ "Israeli Foreign Minister Views Rare Book Collection During Visit to Library and Archives Canada". LAC. Retrieved June 3, 2013. ^ "Josephus". LAC. Retrieved June 3, 2013. ^ "The Glenn Gould Archive". LAC. Retrieved June 3, 2013. ^ Shouldice, Alison (July 1, 2013). "Release of 1921 census data on hold". The Kingston Whig-Standard. Retrieved July 9, 2013. ^ "A Behind-the-Scenes Look at LAC: Services for the Public Available in Ottawa". LAC. Retrieved June 4, 2013. ^ "LAC begins implementation of new approach to service delivery". LAC. Archived from the original on May 29, 2013. Retrieved June 5, 2013. Our website now gets close to half a million visits per month. In contrast, LAC’s in-person service hub located at 395 Wellington Street, receives about 2,000 visits per month. These two service points are also trending in opposite directions, with online consultations increasing rapidly, and in-person visits declining slowly but steadily. ^ "Reference by Appointment". LAC. Retrieved June 3, 2013. ^ a b Curry, Bill (May 1, 2012). "Visiting Library and Archives in Ottawa? Not without an appointment". The Globe and Mail. Retrieved May 31, 2013. A spokesman for Library and Archives Canada confirmed to The Globe and Mail that the current workforce of 1,065 will be reduced to 850 people over the next three years, as a result of the 2012 federal budget cuts. ^ a b "A Behind-the-Scenes Look at LAC: The Gatineau Preservation Centre". LAC. January 19, 2012. Retrieved June 3, 2013. ^ "Government Records Accessible Outside Ottawa". LAC. Archived from the original on May 29, 2013. Retrieved June 4, 2013. ^ "1997 December Report of the Auditor General of Canada". Office of the Auditor General of Canada. Retrieved June 3, 2013. As part of a composite project to respond to the needs of the National Archives of Canada, including the need to arrest the deterioration of records in existing storage facilities, a new conservation and laboratory building was constructed in the city centre of Gatineau, Quebec, at a total project cost of $107 million. ^ "The LAC Preservation Centre: What's there?". LAC. Archived from the original on May 30, 2013. Retrieved May 27, 2013. ^ "Library and Archives Canada Preservation Centre". LAC. Retrieved June 3, 2013. ^ Cook, Maria (May 11, 2000). "Cultural consequence". Ottawa Citizen. Archived from the original on June 6, 2013. Retrieved October 11, 2009. ^ "Nitrate Film Preservation Facility". Treasury Board of Canada Secretariat. Retrieved June 4, 2013. ^ "Library and Archives Canada Marks the Opening of the New Nitrate Film Preservation Facility". LAC. June 21, 2011. Retrieved May 28, 2013. ^ "Official Opening of Library and Archives Canada's Nitrate Film Preservation Centre" (Press release). LAC. June 17, 2011. Retrieved May 28, 2013. ^ "A Behind-the-Scenes Look at LAC: The Nitrate Film Preservation Facility". LAC. Retrieved June 4, 2013. ^ "Library and Archives Canada preparing for big move". CBC News. July 28, 2012. Retrieved June 3, 2013. ^ "Minutes of the Depository Services Program Library Advisory Committee (DSP-LAC) Meetings, 2009". Government of Canada. August 24, 2009. Retrieved May 28, 2013. It was recently announced that funding was received from Treasury Board to convert a building (formerly, a Zellers department store) in Gatineau into a high-density storage facility. ^ "Montel Awarded the Library and Archives Canada New Collection Storage Facility High Bay Metal Storage Shelving Contract". Montel. January 18, 2012. Retrieved May 27, 2013. ^ Butler, Don (February 28, 2013). "Museums mostly unconcerned about loss of federal funding". Ottawa Citizen. Archived from the original on June 30, 2013. Retrieved May 27, 2013. Much of the $20-million decrease in the Library and Archives Canada budget is accounted for in the conversion of the building in Gatineau to a high-density shelving collection storage facility, which is nearly complete. ^ Pilieci, Vito. "Government moves closer on $400-million document preservation facility". Library and Archives Canada =January 31, 2019. Retrieved March 23, 2019. ^ "Stay Connected". LAC. Retrieved May 26, 2013. ^ "The Shamrock and the Maple Leaf". LAC. Retrieved May 26, 2013. ^ "Library and Archives Canada Revamped Web Presence". LAC. Archived from the original on June 11, 2013. Retrieved June 5, 2013. ^ "Creating a New Kind of Knowledge Institution" (PDF). LAC. Retrieved June 5, 2013. ^ "LAC Directions for Change" (PDF). LAC. Retrieved June 5, 2013. ^ a b "Modernization". LAC. Archived from the original on June 11, 2013. Retrieved May 26, 2013. ^ a b "Library and Archives Canada". Treasury Board of Canada Secretariat. 2009. Archived from the original on June 3, 2013. Retrieved June 5, 2013. Under the guidance of the new Deputy Head, Library and Archives Canada (LAC) has identified new strategic directions for the organization and implemented a change management agenda. More broadly, LAC continues to adapt to technological changes in dealing with its mandate to preserve and make available the documentary heritage of Canada. LAC has commenced a modernization initiative and has also established a "Documentary Heritage Management Framework" to meet the challenges of collecting and preserving information in an environment that is transitioning from analogue production to digital production. ^ "Documentary Heritage Management Framework". LAC. Archived from the original on March 28, 2010. Retrieved June 5, 2013. ^ Levene, Mark (2010). "Documentary Heritage Development Framework" (PDF). LAC. Archived from the original (PDF) on July 3, 2014. Retrieved June 5, 2013. ^ "Shaping Our Continuing Memory Collectively: A Representative Documentary Heritage" (PDF). LAC. Retrieved June 5, 2013. ^ a b c "Stephen Harper should appoint a pro to head Canada's library and archives: Editorial". Toronto Star. May 21, 2013. Retrieved June 5, 2013. Caron oversaw $10 million in budget cuts in recent years, laying off dozens of staff, eliminating grants to independent archives across the country and, most controversially, ending an interlibrary loan program that massively expanded the reach of the government collections. ^ a b c "Heritage minister looks at restoring local archives program". CBC. June 10, 2013. Retrieved June 11, 2013. ^ a b c Cobb, Chris (June 10, 2013). "Heritage Minister James Moore wants axed Library and Archives Canada NADP program restored". Ottawa Citizen. Archived from the original on June 19, 2013. Retrieved June 11, 2013. ^ "Ex Libris Association Timeline on Library and Archives Canada Service Decline". Ex Libris Association. Retrieved March 18, 2017. ^ "Federal libraries, archives shutting down". CBC News. May 2, 2012. Retrieved May 31, 2013. The federal government is eliminating a series of libraries and archives throughout different departments as part of the latest budget cuts. Library and Archives Canada alone has received or will still receive more than 400 affected notices and the department announced 20 per cent of its workforce would be let go. ^ a b Fontaine, Alana (May 2, 2012). "CLA dismayed by impact of budget cuts on federal libraries" (Press release). CLA. Archived from the original on November 16, 2012. Retrieved May 31, 2013. ^ a b Kirkup, Kristy (May 2, 2012). "Librarians fighting mad over federal cuts". Ottawa Sun. Retrieved April 22, 2013. ^ Munro, Margaret (March 15, 2013). "Federal librarians fear being 'muzzled' under new code of conduct that stresses 'duty of loyalty' to the government". National Post. Retrieved May 26, 2013. ^ Fodden, Simon (March 19, 2013). "The Loyalty Policy at Library and Archives Canada". Slaw. Retrieved May 26, 2013. ^ Munro, Margaret (March 20, 2013). "Federal librarians face new 'behaviour regulation' code". The Regina Leader-Post. Archived from the original on June 29, 2013. Retrieved June 4, 2013. ^ a b Cobb, Chris (May 12, 2013). "Library and Archives boss chastised by heritage minister for taxpayer-funded Spanish lessons". Ottawa Citizen. Archived from the original on June 30, 2013. Retrieved May 31, 2013. The code says employees may accept speaking invitations as long as they don’t speak about LAC’s mandate and activities. Caron has countered criticism by saying he has to work within the budget imposed by the federal government and his focus must be less on collecting artifacts and books and more on preserving Canada’s digital record. ^ a b Karstens-Smith, Gemma (May 24, 2013). "Librarians give heritage minister wishlist for top job". Ottawa Citizen. Archived from the original on June 30, 2013. Retrieved May 31, 2013. 'The community has great concerns about the direction of Library and Archives Canada, and has had for a few years now.' ... Those concerns include where cuts are being made and how modernization is occurring, Marrelli said. ^ a b Cobb, Chris (May 16, 2013). "Librarian community calls on minister to appoint professional librarian to replace Caron as head of LAC". Ottawa Citizen. Archived from the original on June 30, 2013. Retrieved May 26, 2013. Hervé Déry, assistant deputy minister of policy and collaboration at LAC, will temporarily replace Caron, who had been critical of the archivist and librarian community for resisting the necessary push to collecting digital born material and digitizing more popular items at LAC. ^ "Save Library & Archives Canada". CAUT. Retrieved April 22, 2013. ^ "Letter from the Association of Canadian Archivists to the Director General of LAC" (PDF). ACA. May 31, 2012. Archived from the original (PDF) on May 14, 2013. Retrieved May 26, 2013. ^ "President's Letters about Library and Archives Canada". Bibliographical Society of Canada. Retrieved May 26, 2013. ^ Beale, Nigel (March 18, 2012). "Library and Archives, Canada's National disgrace (Part 1 of 3)". Literary Tourist. Retrieved April 22, 2013. ^ Milligan, Ian (May 22, 2012). "The Smokescreen of 'Modernization' at Library and Archives Canada". ActiveHistory.ca. Retrieved May 31, 2013. ^ Knowles, Valerie (August 10, 2012). "Closing doors on Canada's history". iPolitics. Archived from the original on June 19, 2013. Retrieved April 22, 2013. ^ "Joint Statement on Qualities of a Successful Librarian and Archivist of Canada" (PDF). Archived from the original (PDF) on September 7, 2013. Retrieved June 6, 2013. ^ "Federal budget cuts to the Library & Archives of Canada stall Truth and Reconciliation Commission | The Nation: Cree News". The Nation: Cree News. September 23, 2013. Retrieved March 1, 2018. ^ Rennie, Steve (April 22, 2014). "Truth and Reconciliation Commission gets access to thousands more documents". The Toronto Star. ISSN 0319-0781. Retrieved March 1, 2018. ^ "94 ways to redress the legacy of residential schools and advance reconciliation". CBC News. Retrieved March 1, 2018. ^ "Truth and Reconciliation Commission of Canada: Calls to Action" (PDF). 2015. Retrieved February 28, 2018. ^ "Archivists look to 'decolonize' Canada's memory banks". CTVNews. February 19, 2018. Retrieved March 1, 2018. ^ "Indigitization Commentary on LAC Initiatives [Thread]". Twitter. February 27, 2018. Retrieved February 28, 2018. ^ Canada, Library and Archives. "Library and Archives Canada's Truth and Reconciliation Commission Web Archive - Library and Archives Canada". Retrieved March 1, 2018. ^ "Guy Berthiaume appointed as Librarian and Archivist of Canada" (Press release). Government of Canada. April 14, 2014. Retrieved April 16, 2014. ^ "Biography of Dr. Daniel J. Caron". LAC. Retrieved May 30, 2013. He was appointed the Librarian and Archivist of Canada on April 24, 2009. ^ "Mr. Wilson's Biography". LAC. Retrieved May 30, 2013. Ian E. Wilson has just retired as the first Librarian and Archivist of Canada. Appointed as National Archivist in 1999, he and the National Librarian, Roch Carrier, OC, developed and led the process to create a new knowledge institution for Canada in the 21st century, the integrated Library and Archives of Canada. When the legislation came into force in May, 2004, Ian Wilson took on this new responsibility. ^ a b "Fellows of ICA: Ian E. Wilson". International Council on Archives. Archived from the original on June 8, 2013. Retrieved May 30, 2013. Dr. Wilson served as National Archivist of Canada, 1999 to 2004, and then as head of the newly amalgamated Library and Archives Canada. He retired in 2009 and received the unusual honour of being named Librarian and Archivist of Canada Emeritus. ^ a b Gagnaire, Catherine (July 5, 1999). "Appointments to the Positions of National Archivist and of National Librarian" (Press release). Office of the Minister of Canadian Heritage. Minister of Canadian Heritage Sheila Copps announced today the appointments of Ian Wilson to the position of National Archivist of Canada and Roch Carrier as National Librarian of Canada. Mr. Carrier will replace the current National Librarian, Marianne Scott, who has held the position since 1984. ^ "Guy Sylvestre fonds". LAC. Retrieved May 30, 2013. He was Associate National Librarian (1956-1968) and then National Librarian (1968-1983) at the National Library of Canada. ^ "W. Kaye Lamb fonds [multiple media]". LAC. Archived from the original on June 28, 2013. Retrieved May 30, 2013. Dr. Lamb was appointed as Canada's first national librarian in 1953 ... Dr. Lamb retired as national librarian in 1968 and as Dominion archivist in January 1969. ^ a b Chabot, Victorin. "Jean-Pierre Wallot, The Historian Archivist, 1985-1997". LAC. Retrieved May 29, 2013. After lengthy consultations with government departments, a Bill was tabled in the House of Commons and was enacted into law on March 25, 1987. The institution which had been known as the Public Archives of Canada since 1872 was renamed the National Archives of Canada, and the Federal Archivist became the National Archivist. ^ a b Laplante, Normand. "Before Mr. Lamb and Mr. Smith went to Ottawa". LAC. Retrieved May 30, 2013. The first is known as a pioneer of archival administration in Canada whose work as Dominion Archivist from 1948 to 1968 made the Public Archives of Canada a truly modern institution ... Most of their personal papers kept at the NA relate to the period in which they led the institution from 1948 to 1984. ^ "Wilfred I. Smith fonds [multiple media]". LAC. Archived from the original on June 28, 2013. Retrieved May 30, 2013. He joined the Public Archives of Canada in Ottawa in 1950. From 1963 to 1968, Smith held various managerial positions within the Archives: chief of the Manuscript Division (1963-1964), director of the Historical Branch (1964-1965), Assistant Dominion Archivist (1965-1968) and Acting Dominion Archivist (1968-1970). In 1970, he was appointed Dominion Archivist, a position he held until his retirement in 1984. ^ Bélanger, Claude. "Quebec History – Gustave Lanctot (1883-1975)". Marianopolis College. Retrieved May 30, 2013. In 1937 he was appointed deputy minister and Dominion Archivist, a position he would hold until his retirement in 1948. ^ "Sir Arthur George Doughty (1860-1936)". LAC. Retrieved May 30, 2013. ^ "Dictionary of Canadian Biography Online – Brymner, Douglas". University of Toronto. Retrieved May 30, 2013.